Using the scoop provided take a small amount, with gently circulating movements apply on face, neck and décolleté. As most of us are short on time, take advantage of those precious hours you shut your eyes. 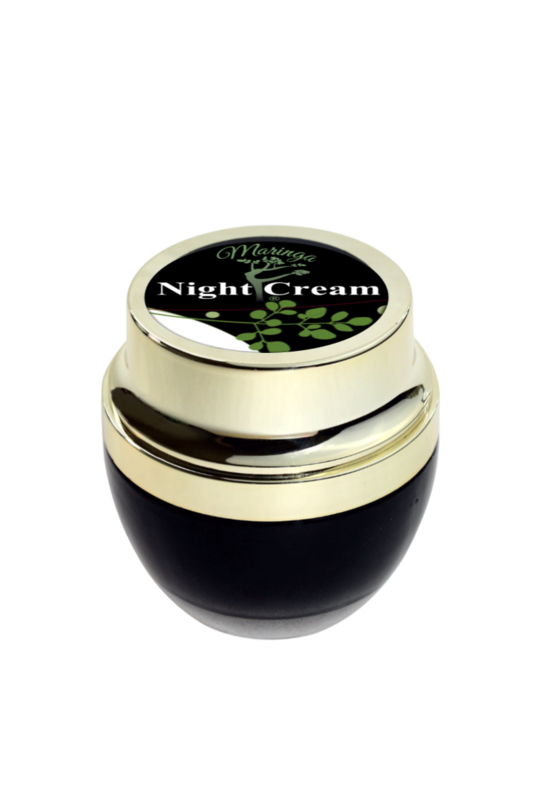 Bed time is the best time to apply skin care by Maringa® NIGHT CREAM and let those powerful ingredients work their magic and take advantage of a true beauty sleep. Aqua, Moringa Oleifera, Butyrospermum Parkii, Theobroma Cacao, Emulsifying wax NF,Stearic acid, Glycerin, Tocopherol, Glyceryl Caprylate. All our products are formulated with anti-ageing properties. With naturally restorative properties, our night cream is produced from entirely natural ingredients, most of which are grown on our own Queensland farm. To create products of the highest quality, every time, we focus on producing the highest quality product that will boost your complexion and return it to its natural state. Night time while you sleep is the perfect chance to nourish your skin. As you sleep, your body is in a natural state of reparations, meaning you are treating yourself at the precise moment that it will see the most benefit. Our thick cream works to rejuvenate over the full eight-hour period, so you wake feeling refreshed and supple. We have made certain that each of our ingredients is as natural as possible, to give your skin the nutrients it deserves most. Taking care the extract concentrated ingredients in as close to their whole form as possible, we either grow our own organic ingredients, or source them from our growing partnerships around our local area. Concentrated pure Moringa Oleifera oil, harvested from our own trees. Native to northern India’s Himalayan region, the oil is known for providing healthy radiance to skin, and boosting your body’s nutritional profile. Shea butter, which works to provide intense moisture, relieve inflammation and redness, and smooth your skin’s surface. Cacao, a raw chocolate-based superfood ingredient that works to brighten tired eyes with antioxidants and rich hydration. With products suitable for every skin type, we have the right product for you. Choose from our night treatment, day creams or all-natural lip balms to see the difference Skin Care by Maringa can make for your complexion. Offering worldwide delivery, we offer a door to door service here in Australia and right across the globe.